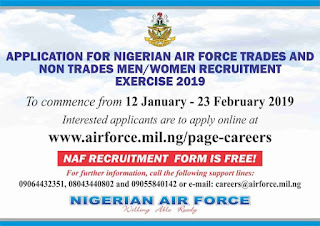 Nigerian Airforce (NAF) Recruitment Application Form, Requirements, Qualifications, Application Guidelines and Closing Date for Tradesmen/Women and Non-Tradesmen/Women [Airmen/Airwomen] 2019/2020 [FREE OF CHARGE]. 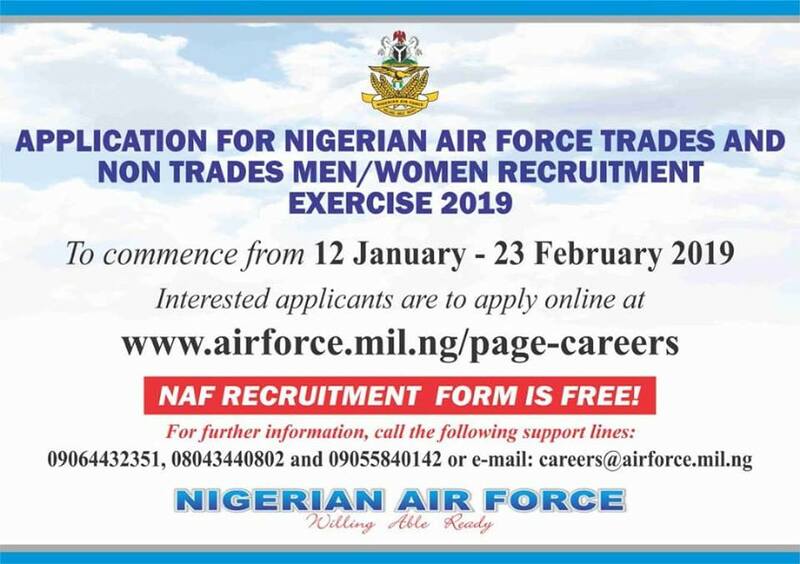 The general public and interested candidate are hereby informed that the Nigerian Airforce recruitment portal for airmen and airwomen is now open for applications for 2019/2020 session. Applicants are to note that Online Registration Starts on 12 January 2019 and closes on 23 February 2019. NOTE: NAF online Registration and all other recruitment processes are free of charge and no payment should be made. Latest Update: Nigerian Airforce Zonal Recruitment Exercise Change of Date 2019/2020. a. Applicants must be between the ages of 18 and 22 years by 31 December 2019.
b. Applicants must possess a minimum of 5 credits including Mathematics and English in SSCE/NECO/GCE/NABTEB. a. Applicants applying as tradesmen and women must be between 18 and 25 years of age except for those applying as assistant chaplains/assistance imams and drivers who must be between 18 and 28 years. c. Drivers must posses a minimum of 2 passes with a credit in English and trade test certificate. Also Read: Nigerian Army 78RRI Recruitment Application Form & Guidelines 2019/2020. 1. Interested applicants are to apply free of charge online at www.airforce.mil.ng/page-careers. Zonal Recruitment Exercise will hold from 16 - 30 March 2019. The Attestation Form must be accompanied by the passport photograph and photocopy of the signees drivers licence or international passport. The signee is also to authenticate the passport photograph of the applicant behind.